Spotted these very tall Star Wars figures for sale in the mall at Geneva Airport on arrival today on my way to attend the global media day for the IATA – the International Air Transport Association. Japan’s All Nippon Airways – ANA – has been thrilling Star Wars fans with its series of Star War’s liveried planes and on March 27 the third and final aircraft in the specially-decorated series of planes will start flying international routes. The aircraft will be unveiled in a ceremony on March 27 at Osaka’s Itami Airport, where the special livery was applied, and will then make a one-off domestic flight as ANA22 from Itami to Tokyo’s Haneda Airport. At just past midnight on March 29, the plane will take off as ANA Flight 106 to Los Angeles and it will then fly various international routes between Tokyo’s Haneda and Narita and Los Angeles, New York, Chicago, Washington D.C. and Houston. The Star Wars theme isn’t just on the outside of the BB-8 plane. Inside passengers will find special BB-8 paper cups and headrest covers and find cabin attendants wearing BB-8 aprons. ANA is having a contest to give away a pair of round-trip economy class tickets from Los Angeles to Tokyo for the first outbound flight. If you don’t win the first prize, you may win one of the 50 second prizes: a special BB-8™ ANA JET model plane. Enter the BB-8 ANA Jet Sweepstakes here. With R2-D2, C-3PO and the Star Wars Stormtroopers on hand, on Saturday Boeing and Japan’s All Nippon Airways (ANA) showed off the carrier’s R2-D2-themed jet at the Boeing Everett Factory north of Seattle. The cool design features aren’t just on the outside. Inside the plane there will be Star Wars-themed service items as well, including paper cups and headrest covers. Japan’s ANA airlines will soon have two new Star Wars planes, decorated with BB-8, a brand new character from Star Wars: The Force Awakens and with our old friend, R2-D2. The new designs are part of an agreement with The Walt Disney Company (Japan) and will be in addition to the previously announced R2-D2 ANA Jet, which is scheduled to go into service on October 18, 2015. The new BB-8 ANA Jet, will be a Boeing 777-300ER. The new Star Wars ANA Jet, which will be decorated with both BB-8 and R2-D2 on the outside, is a Boeing 767-300. The previously announced R2-D2 jet is a Boeing 787-9 Dreamliner. The decorations won’t just be on the outside. 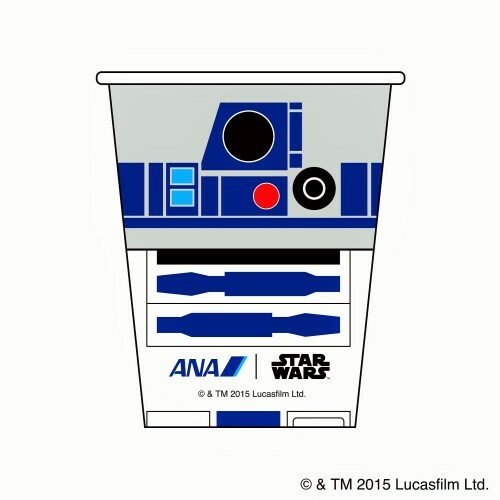 Like EVA Air’s Hello Kitty jets, ANA’s Star War-themed jets will have headrest covers, paper napkins and cups, and no doubt other in-flight service item (Star Wars toilet paper, please…) featuring Star Wars characters. The airline also announcing that it will now offer all six of the currently released Star Wars films as part of the in-flight entertainment options on international routes. All three Star Wars Jets will fly international and domestic routes. The R2-D2 ANA Jet is scheduled to go into service on international routes on October 18, starting as flight NH116 between Tokyo and Vancouver, and then fly between Japan and other cities, including Seattle and San Jose, Munich, Paris and Brussels, Sydney, Beijing and Jakarta. In November, the Star Wars ANA Jet will begin flying domestic Japanese routes, with the BB-8 jet starting international routes, between Japan and North America in March 2016.